Here is the latest report on the stony rises Bio Blitz by Becky McCann, from the Stony Rises Focus Group. Apologies to those of you who have already seen this. 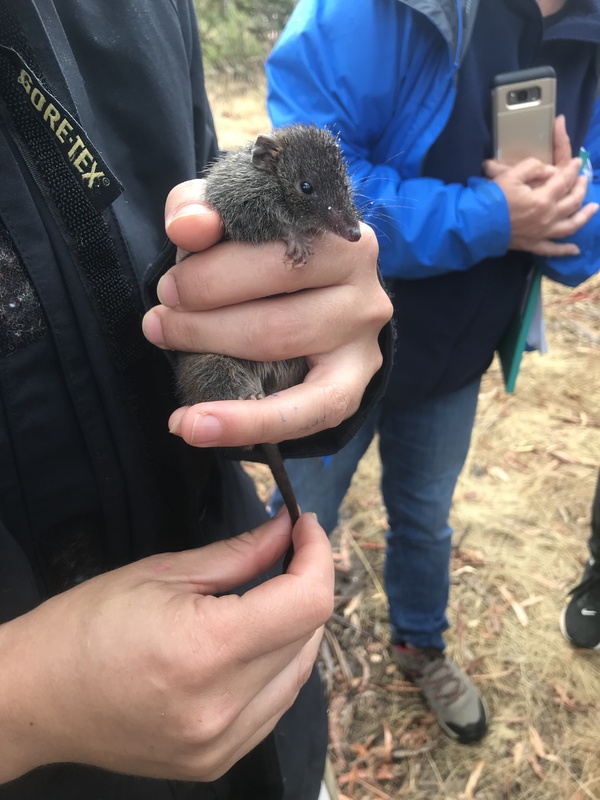 The latest round of The Stony Rises Bio Blitz series confirmed a new breeding population of the elusive Dusky Antechinus, a little marsupial mouse-like carnivore, locally in the Stony Rises country on the Western side of Lake Corangamite. Categories: Activities | Tags: bio blitz, stony rises | Permalink. Here is a flyer for the possibly last (for now), Stony Rises Biodiversity Blitz. Info from Becky McCann: This Blitz has a focus on further wildlife surveys, particularly microbats and finding the elusive Dusky Antechinus, that little marsupial mouse-like carnivore that we haven’t found yet at this property, but there’s a really good chance they are present, and this could be a great opportunity to help us make that important discovery! This is a rare chance to explore an incredible and often under-appreciated part of our volcanic landscape, get to know the local plants and wildlife while participating in important citizen science surveys, and pick up some practical tips and skills along the way, working alongside experts who are happy to share their knowledge. Details on the flyer attached or contact me for more information (and to register). Categories: Activities | Tags: bio blitz, stony rises, VVP | Permalink. 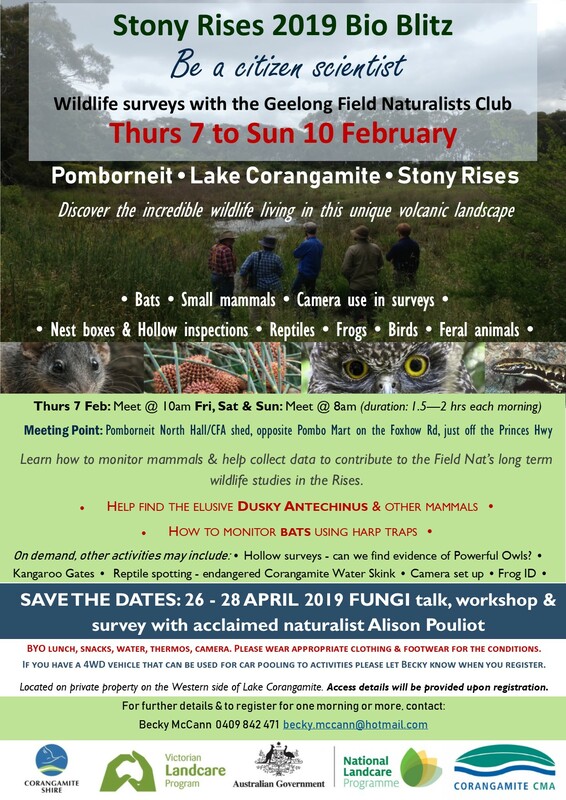 You are invited to the Stony Rises Winter Wild Biodiversity Blitz! 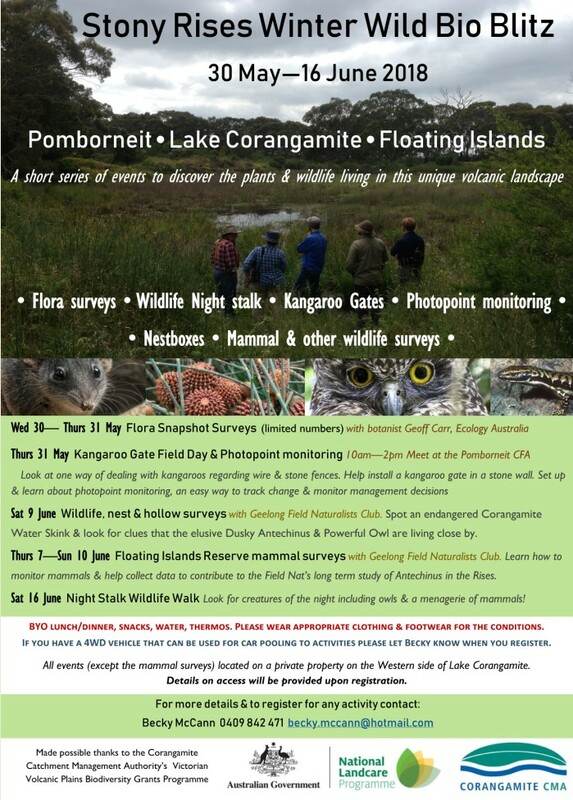 A chance to explore an incredible and often under appreciated part of our volcanic landscape, get to know the local plants and wildlife while participating in important citizen science surveys, and pick up some practical tips and skills along the way, from monitoring our biodiversity to building kangaroo gates in your fences (wire and stone).